Alright, I think it’s time to tackle a moderately popular topic in the world of digestive conditions. If anyone out there has heard of, taken, thought about, or seen Iberogast, then you’ve come to the right place. It’s not so easy to find information on this product. In fact, if you live in the US, it’s not even all that easy to buy this product. So let’s find out why. I could talk about each of these ingredients individually (and you’ll notice that some of the names above are linked because I’ve already done that! ), but then I’m pretty sure we’d be here all day. So for now, we’ll just look at this hodge-podge that goes by the name of Iberogast. It’s important to realize that Iberogast is what is considered a “proprietary blend”. This means that we are not told how much of each ingredient is found inside of it, which can be a problem. If we don’t know what is inside, then we are not able to evaluate the safety of the doses. We are also not able to identify which ingredient(s) might be helping or hurting. There are actually a handful of studies available that have looked at using Iberogast for a few different GI conditions. Some of the studies are better than others, but we’ll take a quick look at each of them right now. Bringing all of the studies together, it seemed most likely for people to benefit when taking 1mL, three times a day for 4 weeks. This helps to demonstrate why a “proprietary blend” can be such a difficult product to evaluate. There are a lot of ingredients here that are the same, but there are also some missing. And yet the product seems to work very similarly. So is it really just 1-2 ingredients that are doing the good work? What about the rest? Are they helping or hurting? One study compared Iberogast to one of the treatments for gastroparesis that is no longer available in the US – cisapride (a pro-motility drug). In this study, they found that Iberogast seemed to work as well as cisapride in controlling the symptoms of gastroparesis and/or dyspepsia. Remember that Iberogast #2 that we just talked about? They tested that product, too, and found that it was just as effective as Iberogast #1. This raises that same question – why have more ingredients if fewer will do? This is promising information, but the study had some issues that made the results a little bit uncertain. So let’s look at another study. – Gastric emptying times did not change for either group. Some doctors had been hoping that Iberogast was speeding up motility, but that does not seem to be the case. Iberogast may help to improve symptoms for some people, but we are not sure why it works. And if there is an option to buy the Iberogast product with fewer ingredients, it seems that it will provide the same benefit, which probably makes it a safer option. So Who Should Use It? 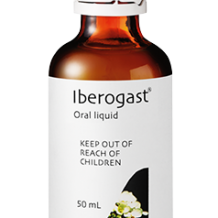 The ingredients in Iberogast have not been studied extensively. For most of them, we only know that they are safe to take for up to 8 weeks – we are not sure if it remains safe to take these products daily for much longer than this. So if you choose to use Iberogast, use it with caution. It seems that there might be some benefit to be had for people who experience a lot of the symptoms that improved the most with this product – acid reflux, nausea, vomiting, and cramping. For others, this might not provide much relief. That’s where this gets a little bit interesting. Iberogast is made by a German company, so it is pretty available for purchase in Europe. For some reason, it was never really marketed in the United States and never became popular enough to warrant selling it here, so it is not very easy to come by. With the advent of internet shopping, many people have found access to it on sites like Amazon. If you decide to purchase it online, I have one more word of warning for you – the company that makes it does not hold any certifications on quality and purity. This means that you buy at your own risk – there is no guarantee that the product is not contaminated or is safe for use. Are you on the fence about purchasing and using Iberogast? You might want to check out my article on peppermint first.